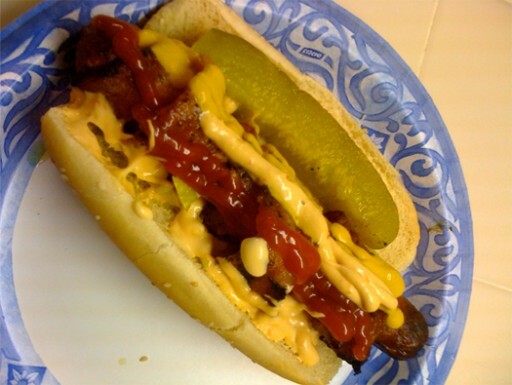 This is my personal take on a Bacon Wrapped Hot Dog. For my first post I am digging into my BBQ archives, while I prep some new BBQ extravaganzas. Costco hotdogs (yes the large ones) wrapped in bacon, and grilled to juicy perfection. Placed in a large sandwich roll with Pepperoncinis, Mustard, Spicy Mayo, (some put ketchup as seen here) and a large pickle slice served with fries. Wow…that looks wicked yummy. I’ll need to try that very soon. 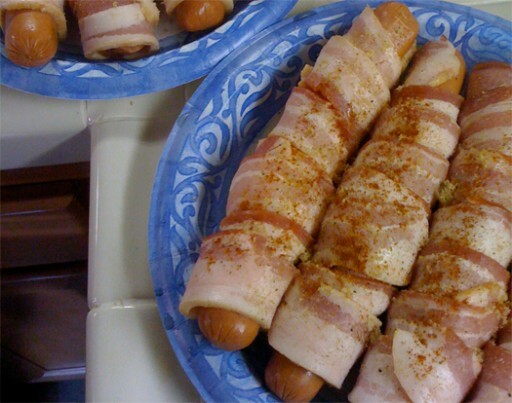 There is absolutely nothing wrong wrapping anything thing in bacon, especially a hot dog, and THEN grilling it. Pure perfection!